Whilst walking along the beach at South Beach, Studland, Dorset we found this odd shaped stone. My daughter thought it looked like a stone age spear head, whilst I thought it might be a dinosaur tooth. After further investigation online I came across belemnites and wondered if that's what it could be? It is approximately 3 - 4 inches long. I have taken some photos and would appreciate any help in identifying what it actually is. Many thanks. While this specimen has the general shape of a belemnite it shows signs of wear. We can't tell what shape it was originally because we don't know how much wear. 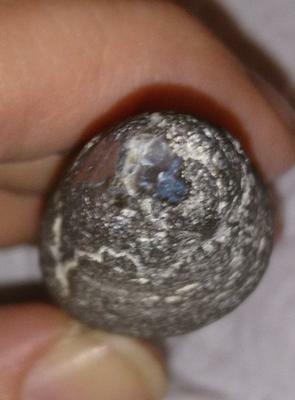 The darker circles look like they might be some kind of fossil, That and the white spots lead me to believe that this is not a belemnite. 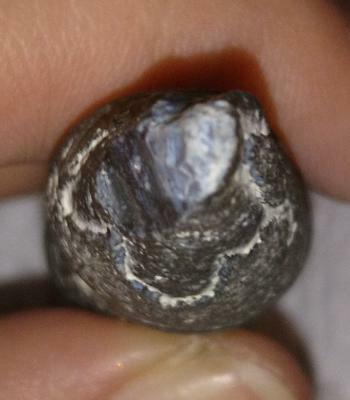 All of the belemnites I have seen are uniform in color and texture. I think this rock may have some fossils in it, (the circles), but I can't tell what they are. Sorry I can't be more helpful.